Geek's Guide to Britain Proving it's not just the Victorians who can make huge structures in steel, the Falkirk Wheel can lift six canal boats 25 metres in one go, moving them from one waterway to another. The Forth & Clyde Canal, running across central Scotland, used to be connected to the Union Canal, linking Glasgow to Edinburgh via a stairway of 11 locks. That stairway was closed up and filled in back in 1938. 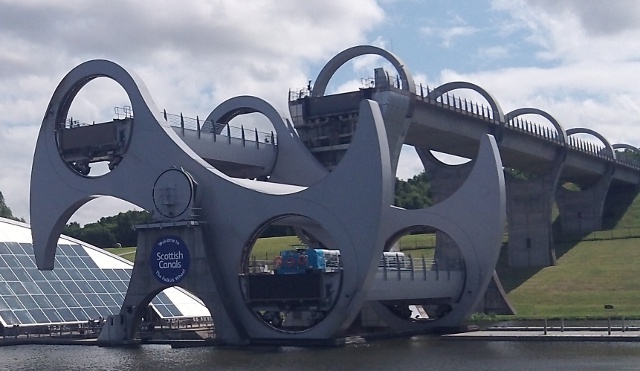 The millennium project to reconnect the canals needed something spectacular to go in their place, and this arrived in 2002 in the form of the Falkirk Wheel. The wheel is huge (35m across), though cunningly concealed from the car park so it emerges to dominate the landscape as one approaches on foot. The steel and concrete structure contains 15,000 hand-tightened bolts and one can't help but be reminded of some Victorian fantasy as it slowly revolves to deliver the 300 tonne, perfectly balanced, gondolas. The wheel can lift six boats at a time, consuming only 1.5 kilowatt-hours - enough to boil six to eight kettles as we're repeatedly reminded during our tour. The boats (and the water in which they sit) rise 25 metres to the Union Canal, while the wheel lowers an equally-heavy load on the other side for balance. The balance is perfect as boats displace their weight in water while interlocking cogs keep the gondolas horizontal throughout. It takes a little over five minutes for a full rotation, and the direction is changed every few days to keep the wear and tear evenly spread, though a good deal of the traffic is the tourist tour which goes up and down every couple of hours. The Forth & Clyde Canal was opened in 1790 to provide a coast-to-coast (firth to firth) route as a shortcut for seagoing vessels as well as intra-Scottish trade. It was bankrolled by cash borrowed from the government, but it made money on tolls and taxes. The Union Canal came 30 years later and spurred off from the Forth & Clyde to link up with Edinburgh, connected with the aforementioned stairway of 11 locks. It too was profitable, carrying horse-powered cargo and travellers on steam-driven "swifts" that featured a projecting scythe to slice through row ropes of cargo craft too slow to move aside. It linked Glasgow to Edinburgh in less than seven hours. But the railways put paid to their profitability, cutting journey time and cost. Both canals fell into disuse: the last commercial boats climbed the staircase in 1908, though the locks weren't filled in until 30 years later. In 1963 came the final indignity - the A80 was simply built across the Forth & Clyde Canal than over a bridge, as no-one wanted canals any more. But British canals had already started a rebirth as tourist destinations and sites for leisure activities. The millennium engendered an optimism ready to embrace Big Engineering, and the National Lottery was looking for showpiece projects to fund. So, in 1994, the Millennium Link was announced. The plan was to reopen both canals, and put something significant between them. 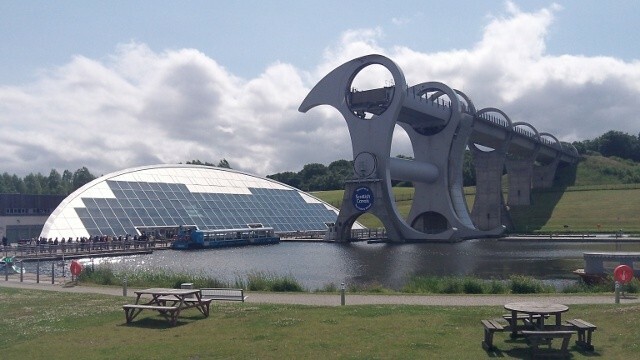 Suggestions were solicited, and the Falkirk Wheel (which is apparently based on the shape of a traditional two-headed axe) was the winning entry, not least because it looks so damned dramatic. 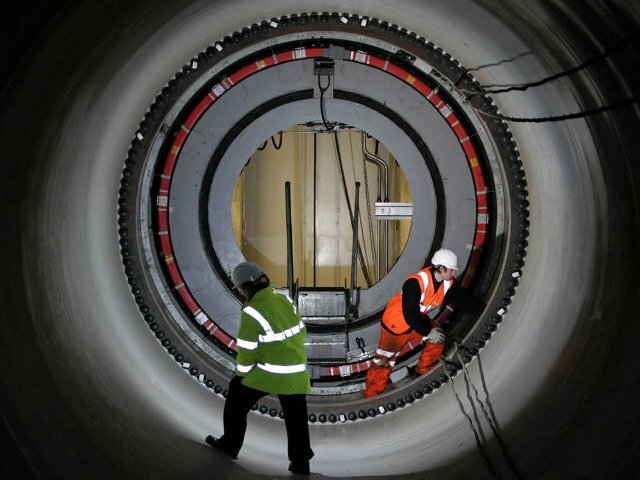 The Millennium Link project cost a total of £85.5m, £32m of which came from the National Lottery by way of the Millennium Commission, the rest coming from British Waterways and various local authorities along the route. 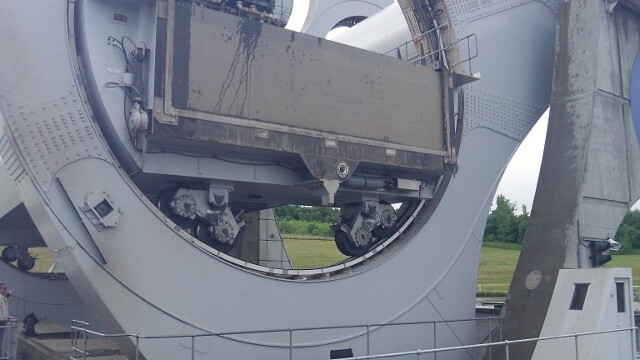 £17.5m of that was spent on the Falkirk Wheel as a centrepiece to the project. Principle architect Tony Kettle apparently built the whole thing out of Lego before selling the idea to the Commission, and it's easy to imagine how it would have looked in model form as the full-sized object defies scale until one can reach out and touch it. Which is quite easily done even without taking the half-hour tourist trip. Adjacent to the wheel is a visitors' centre, which used to contain local history and information about how the mechanism works. These days that's reduced to a few wall hangings with space given over for the extended shop selling the usual gumble - but step outside and one is confronted by the reality of Big Engineering in action. The tourist boat will take one for a half-hour trip up and down, but it's only a ten-minute walk to the Union Canal where one can walk through the last canal tunnel cut in Britain to the two traditional locks that raise boats the remaining 11 metres. It's not permitted to walk out onto the aqueduct leading to the upper end of the wheel, but the views are still pretty spectacular. Sadly one can't get inside any part of the wheel, though engineering teams do venture into the central axle to grease the bearings every now and then. Strange as it sounds not everyone is interested in watching massive machines turning all day. Children may be sold in a single turn (which can be guaranteed thanks to the regularly running tourist boat) but won't be distracted for more than a moment by the displays inside. Thankfully there's a decent playground outside, and an amazing water park where the young 'uns can open and close valves, jump on pressure pumps and spin enormous wheels to carry water up and down slopes. 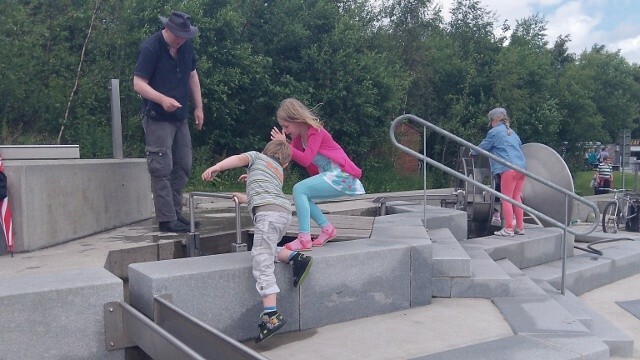 There's even a child-powered Archimedes Screw to show off what's possible. The water system is all integrated, so works best when there are children (and adults) all over it. There's also a second water park higher on the slope, though during our visit that wasn't in use, ironically because of heavy rain. In good weather the wheel and surrounding area are spectacular, and there's plenty to see if the water park and wheel aren't enough. Rough Castle Fort is walking distance away, along with the Antonine Wall that runs above the newly cut tunnel, and the really bored can climb into a giant plastic ball and roll around in the docks for a bit, for a reasonable fee. We expected to spend an hour or two visiting the Falkirk Wheel, just to see the engineering and take a boat trip to the top. We ended up spending an entire day walking around the area and working out how to feed water through the various channels in the park. By car from Edinburgh: Take the M9 west for Stirling, exit at junction eight, follow signs for The Falkirk Wheel. From Glasgow: From the M80/A80, follow signs for Falkirk and then signs for The Falkirk Wheel. For more details, and for train and bus information, click here. Admission is free and parking on site costs £2 for the day. Boat trips cost £8.95 per adult, £7.95 for concessions and £4.95 per child. Opening hours: The Falkirk Wheel visitor centre and cafe are open every day from 10am to 5.30pm. The boat trips run at various times: you are strongly advised to check the website before travelling. For more Geek's Guides to Britain from The Register, click here.